Justin Dunn wasn't thrilled with his first outing against Northwest Arkansas this season. The rematch was much more to his liking. Baseball's No. 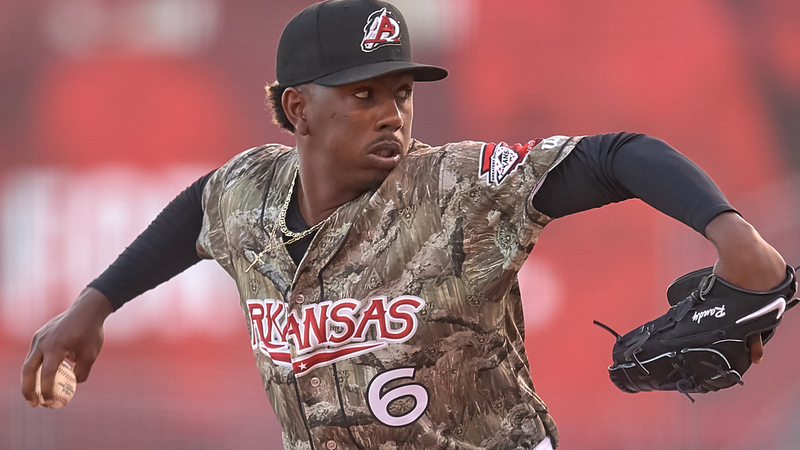 88 overall prospect took a no-hitter into the sixth inning, ultimately allowing one single and striking out eight over 5 2/3 innings as Double-A Arkansas blanked Northwest Arkansas, 2-0, on Monday at Dickey-Stephens Park. "Going into the last outing against them, I felt like I had a pretty good report, did my homework on them a couple nights before the outing," said Dunn, who allowed three runs -- two earned -- on four hits over 3 2/3 innings opposite the Naturals on April 9. "I went out that night and just didn't really have the best fastball command. I still had good results for not really having my best stuff, kind of had the second-start blues I feel like, but I had the feeling that if I executed my plan, I'd have some pretty good success against them. I was lucky enough to have success tonight." The right-hander's only traffic Monday came via walks. He issued a free pass to Naturals leadoff man Nick Heath in the first inning, one to Kort Peterson in the third and another to Khalil Lee in the fourth. None of those players moved past second base. "I wasn't really 0-1, 0-2 on everyone like I wanted to be," Dunn said. "I was pitching from a lot of disadvantaged counts and having to work from behind and attack the zone. It helps that our park is a graveyard, so I can kind of pitch to barrels a little bit and not be scared to attack them. I was just lucky enough to miss barrels tonight. That's really all it is." Heading into the sixth, Seattle's No. 3 prospect kept Northwest Arkansas out of the hit column and fanned at least one batter in every inning since the second. D.J. Burt, the Naturals' nine-hole hitter, broke through by leading off the sixth with a line-drive single to right field. After Burt swiped second, Dunn buckled down to punch out Heath and Lee before departing, having thrown 57 of 89 pitches for strikes. Jack Anderson finished the sixth and followed with a scoreless seventh. Bryan Bonnell and No. 21 Mariners prospect Art Warren combined to finish the shutout. "Jack came in and did a great job," Dunn said. "I didn't want him to have to come into that spot right there. I tried to beg and plead with [manager Mitch Canham] to leave me in there, but I had to do what's best for the team, best for my arm at the same time, and come out of the game." The 23-year-old began his season with an impressive outing on Opening Night at Tulsa, permitting one run on five hits and one walk while striking out seven over five frames. Five days later, Dunn scuffled his first time out against the Naturals. Monday provided some redemption. "For me, the biggest thing tonight was getting into the sixth, getting into the seventh," he said. "It seems like I'm the only guy on the staff so far who hasn't gotten into the sixth until tonight, so that was a little bit of a monkey on my back. I'm happy I got that one off of it. Getting deeper into games, feeling stronger as I get going, that's always a big thing and just having overall command. Three walks tonight, I wasn't really happy with that. That's not going to cut it late in the season, and that's the difference between me getting to the sixth or getting through the sixth and going out for the seventh later in the season." The Boston College product is in his first season with the Mariners after being acquired from the Mets over the offseason. Last year, Dunn went a combined 8-8 with a 3.59 ERA in 24 starts between Class A Advanced and Double-A. Getting his first work in the Texas League, Dunn is adjusting to some unexpected, but interesting differences. "Coming out first game against [Tulsa], they came out swinging," he said. "It seemed like in the Eastern League, guys were a lot more patient, really looking for their pitch to hit, but when they got it, they did damage to it. In this league, it seems like guys are swinging because they don't want to get deep in counts. They want to hit the fastball early and get out of the box. "I like guys that swing better. It helps me get to my slider, helps me get to my curveball. It helps me get to the stuff for the strikeouts. I just try to make a quality first pitch and really not give them something they can do damage to early in the count. If I can get ahead right there and have a good feel for the breaking ball, it's going to be a fun day."